"Greg Stube's book, Conquer Anything, shows us through his harrowing story how to stand up for freedom to become embodiments of the American dream. This is more than a Special Forces book, this is a guide to creating our own A-Teams to help us succeed in life and business." "This is the best translation of how to effectively translate and use the United States Military Special Operations ethos in your everyday work environment. Great military stories combined with life lessons learned, bring this book from the battlefield to the boardroom. A great read!" "My friend Greg Stube provides a defining example of an American who has met the call to duty as a human being, a father, a heroic combat disabled Green Beret, a life coach for vulnerable children, and a motivational speaker for corporate leaders and the FBI. 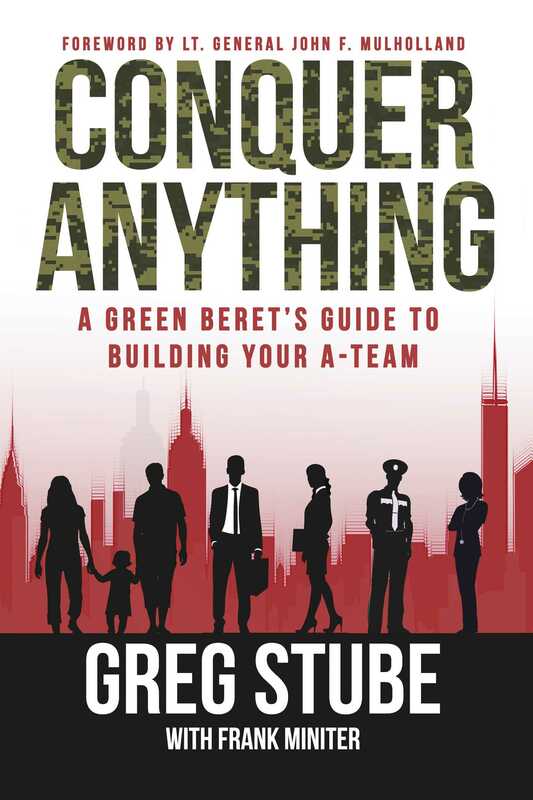 Conquer Anything: A Green Beret's Guide to Building Your A-Team is an exceptional roadmap to success for individuals, families, corporations, and government entities. Greg has distilled hard-won lessons from his extraordinary life experiences to illuminate how each person can create the future they want."